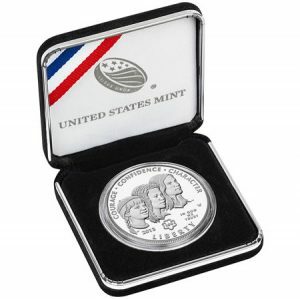 2013 Girl Scouts of the USA Centennial Silver Dollars are now available from the United States Mint. They went on sale at noon Eastern Time today, February 28, 2013. There are two 2013 Girl Scouts of USA Silver Dollars. One is in collectible uncirculated quality, shown left, and the other is in proof quality, shown right. Proof coin sales tend to be stronger. The commemorative coins were also officially launched in a ceremony on Capitol Hill. "Today, the United States Mint launches the 2013 Girl Scouts of the USA Centennial Silver Dollar Coin honoring 100 years of courage, confidence, and character," Treasurer of the United States Rosie Rios said at the release ceremony. Treasurer Rios was joined in the launch ceremony by Girl Scouts of the USA Chief Executive Officer Anna Maria Chávez and members of the Honorary Congressional Girl Scout Troop — Troop Capitol Hill. Authorized by Public Law 111-86, these Girl Scouts of the USA Silver Dollars celebrate the organization’s 100th anniversary and the achievements of the millions of women who have been influenced by the Scouts. Juliette Gordon Low of Savannah, Georgia established the Girl Scouts on March 12, 1912. Today, it is the largest girl-oriented organization in the world with over 3.2 million girls and adult leaders in the U.S. and its territories. During the first month of availability, the one-ounce proof Girl Scout silver coin is $54.95 and the one-ounce uncirculated Girl Scout silver coin is $50.95. Introductory prices will last until 5 PM ET March 29, 2013. Since the U.S. Mint is not implementing a household limit, coin collectors and Girl Scout supporters can order as many silver dollars as desired unless the maximum mintage of 350,000 across all options is depleted. The ratio of proof to uncirculated strikes is determined by orders for them. When regular prices go into effect on March 29, they will be $5 more than they are right now. The table below summarizes the details. Not all silver dollars will get sold individually. The U.S. Mint plans to release a Girl Scouts of the USA Young Collectors Set later this year. At this time, all that has been announced is that the set will be limited to 50,000 units and it will include an uncirculated silver dollar. Designs of the proof and uncirculated silver dollars are emblematic of the centennial of the Girl Scout’s association. The obverse was created by Barbara Fox and sculpted by Phebe Hemphill. It depicts three girls of varying ages, representing the diversity of the Girl Scouts. In the center just below the girls is a Trefoil symbol to signify the centennial anniversary. Inscriptions include elements of their motto with COURAGE, CONFIDENCE and CHARACTER across the top. Below are more inscriptions stating 2013, LIBERTY and IN GOD WE TRUST. The mintmark, W, shows the commemorative coins were minted at the U.S. Mint facility in West Point. Designing the reverse was Chris Costello, and sculpting it was Joseph Menna. The image depicts the iconic Girl Scout emblem of the association, three silhouetted faces of Girl Scouts within the trefoil. Inscriptions are UNITED STATES OF AMERICA, E PLURIBUS UNUM, $1 and GIRL SCOUTS. Each 2013 Girl Scouts of the USA Centennial Silver Dollar is composed of 90% silver and 10% copper. They weigh 26.73 grams, sport a 1.5 inch diameter and have reeded edges. They are legal tender of the United States. Proof coins differ from uncirculated coins, a difference that is achieved during the manufacturing process. Proof blanks are specially treated and hand-polished to give them their mirror-like backgrounds. Their foregrounds are sculpted and frosted to give the proof coins their "cameo" effect. Proof coins are struck with polished dies at least twice. Uncirculated coins are struck on specially burnished blanks and have a soft, matt-like finish appearance. Individual proof and uncirculated 2013 Girl Scouts of the USA Centennial Silver Dollars may be ordered directly from the U.S. Mint either online or by phone. The U.S. Mint website is http://www.usmint.gov/catalog and phone number is 1-800-USA-MINT (872-6468). Specifically, the silver dollars are found right here. There is a shipping and handling of $4.95 for domestic orders. A surcharge of $10 for every coin sold will be "paid to the Girl Scouts of the United States of America to be made available for Girl Scout program development and delivery," per the Girl Scouts of the USA Centennial Commemorative Coin Act, signed by the President into or Public Law 111-86 on October 29, 2009. Girl Scouts of the United States of America is an organization that is dedicated solely to girls for the purpose of building character and skills for success. Their mission statement says, "Girl Scouting builds girls of courage, confidence, and character, who make the world a better place." To learn more about this organization, visit their website at www.girlscouts.org. The U.S. Mint issues two commemorative coin programs per year. Coming mid-March will be the 2013 5-Star Generals Commemorative Coin Program, with gold, silver and clad coins. Think how many boxes of Thin Mints I could buy for the same price as this coin??? Well, on second thought, not that many boxes after all, but enough to keep me happy for a weekend. but the coin willlast sooo much longer..its for a good cause. the kids should love it!